Another Orang Asli church building in Kelantan under threat of demolition? I received the following media release, background facts, copies of letters and photographs from Suaram by e-mail about an hour ago. 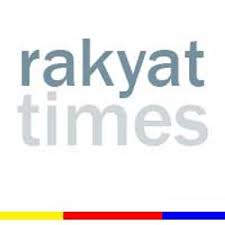 The Christians in the Temiar village of Pos Pasik, about 70 km northeast of Gua Musang Kelantan, have been told by the Department of Orang Asli Affairs (JHEOA) that they have no permission to build a church on their land. However, on 9 August 2010, the Deputy Director-General, writing on behalf of the D-G, replied that their “application” to build the church had been rejected and the community was asked to stop work on the building immediately. 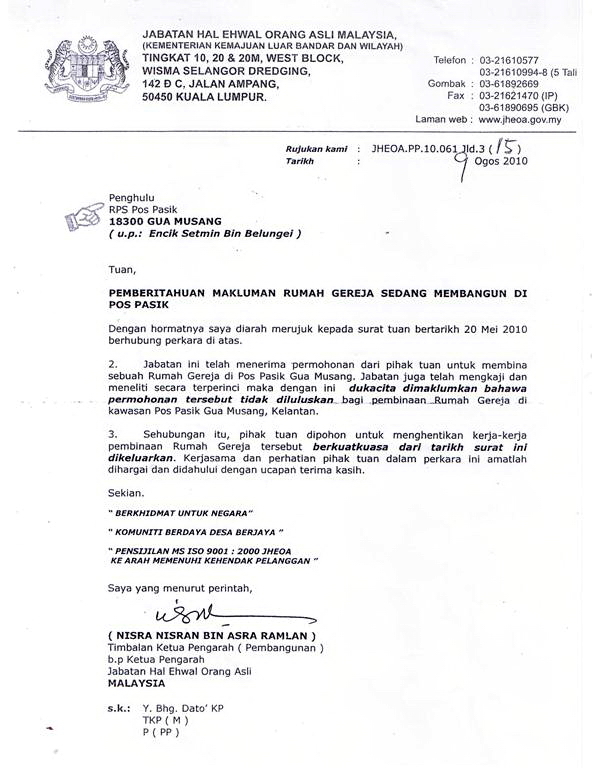 The Orang Asli are not happy with this answer as they did not seek permission from the JHEOA. They merely exercised courtesy to inform them of their plans. The Orang Asli of Pos Pasik consider it their right to build such a structure on their land, in accordance with the Constitution. The lawyer representing the Temiar headman has recently written to the D-G informing him that the department’s permission was not being sought. He also sought the reasons for the rejection of the church building. 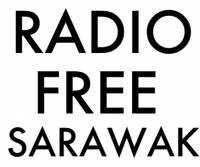 If the church is demolished or stopped, it will be the second Orang Asli church in the state of Kelantan (and no less than 5 in the peninsular altogether) that have been demolished by the authorities on the basis of various excuses, including that the Orang Asli do not have rights to the land concerned. But it is evident that the issue is religion-related as other structures, including suraus, have been build on such lands without any issue. But as land is a state matter, the Temiars of Pos Pasik are seeking the intervention of the Menteri Besar of Kelantan in this matter. Pos Pasik is situated about 70 km northeast of Guas Musang in Kelantan. It is in forested area at the foot of the Titiwangsa Range. 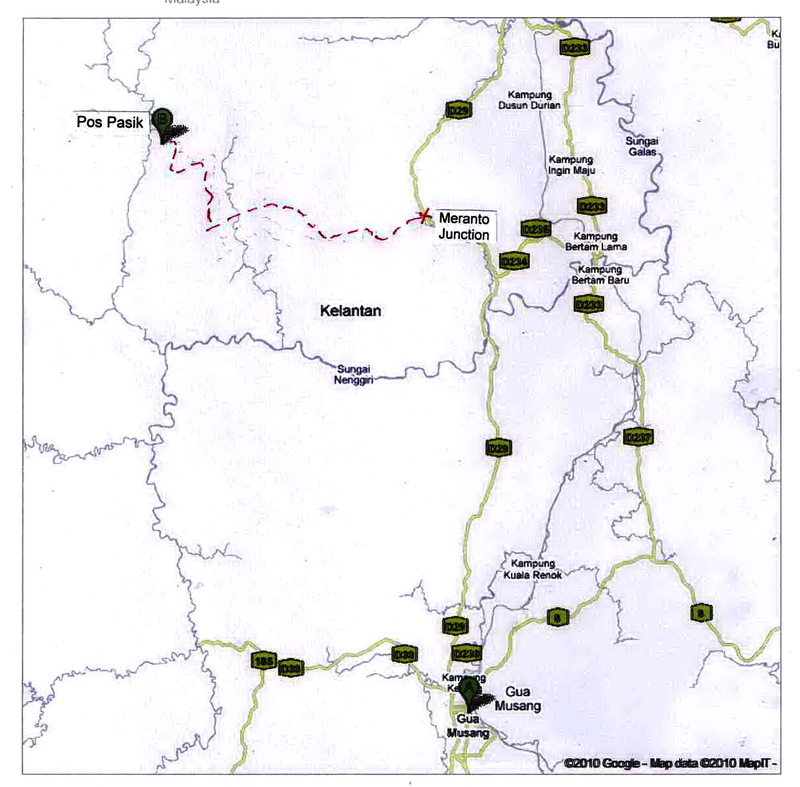 The post includes the villages of Kg Pasik, Kg Ayung, Kg Bayor and Kg Serai. The Orang Asli here are of the Temiar ethnic group with a few being Jahai. It is situated on both sides of Sungei Jenera, with a population of over 600. The villagers are connected to the main road at Meranto by a logging track. Pos Pasik is only reachable in a proper 4 wheel-drive vehicle and takes about 2-3 hours of traveling time. On 3 December 2001, 297 villagers of Pos Pasik were baptized as Christians, including the two Penghulu (headmen). A bamboo church was then built in the old village across the river (Sungei Jenera). In the late afternoon of 19 December 2004, the Sungei Jenera overflowed its banks, rising to a height of 30 feet above the normal water level of the river. The bamboo houses of the Temiar by the river were all washed away. So too the church. By 2006, many of the villagers shifted to the current side of the river and the bamboo church was relocated there as well. Currently, a total of 530 villagers of Pos Pasik have converted to Christianity but quite a number have left Pos Pasik to work in other areas. In 2008, the government provided brick houses and agricultural plots for the communities there. The road has also been improved though it is almost inaccessible during the rainy season. 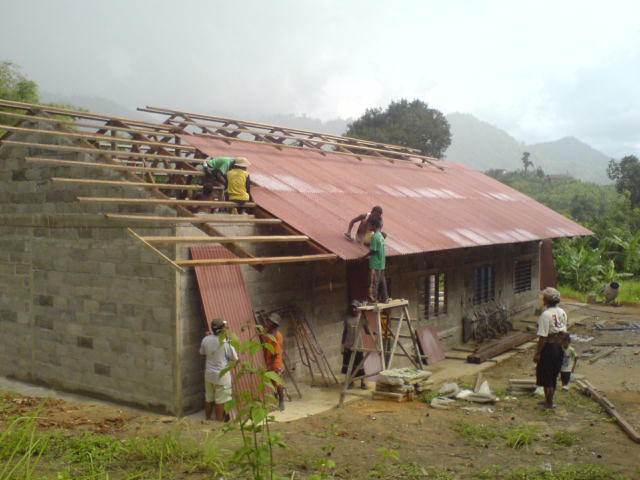 In late 2009, the Christians requested the pastor from the Gospel to the Poor church to help them build a brick/concrete church since most of their houses are already made of brick. This is to replace the dilapidated bamboo church. By April 2010, they started clearing the land of rubber trees belonging to one of the villagers. At one of their meetings, it was decided that the headman should update JHEOA of the latest development by informing them through the mail. Work then began on the church construction. 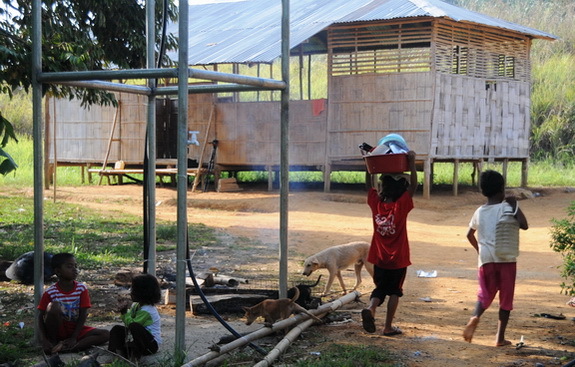 The workers were all Orang Asli volunteers with the necessary materials being raised through church donations. During this period of construction, they had a lot of uninvited visitors especially those from the religious bodies. 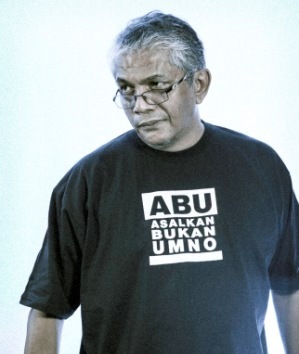 ← Is UMNO/BN the solution or the problem? Only God knows if I have aslamtu enough to be worthy of being called a Muslim. I am curious to know what Bang Haris’ religious background has to do with this news? Or are you insinuating that only Christians can help Christians and in this case, the Christian Orang Aslis should never be helped by a Muslim like Bang Haris? You know what that did to the cat, right? LOL!!! LMAO…..curious had no idea! Thanks so much for highlighting this in your blog. You are the epitome of 1Malaysia. Anything we concerned Malaysians can do to help the situation affecting the Orang Asli there? Good assertive letter asking the obviously clueless but definitely pompous DG of JHEOAM to sod-off. What is the necessity for a special government department to just exist to look after the affairs of Malaysians who are of Orang Asal/Asli ethnicity? Is there such an exclusive government department also in existence to look after the affairs of Malaysians who are of Malay ethnicity? And another equally exclusive government department to look after the affairs of Malaysians who are of Chinese ethnicity? Or another equally fat and bloated civil service gravy-train-moded department to look after the affairs of Malaysians who are of Indian ethnicity? And so on and on and on…. Then why bother with the hot air marketing balloon promoting that pseudo-usp of a 1Malaysia product? More wayang kulit by UMNO? The half breeds in Umno made law in Umno that anyone calling himself/herself a Malay must also be a muslim in addition to other earthly requirements just so to enable themselves, the half breeds, the right to be an Umno member. As a result Umno has isolated the Original People of Malaya, the Orang Asli, as children of the soil regardless of what law they passed the Orang Asli are still the original people and not the so called Malays. Malays just like the Chinese and Indian.In very recent years some so Malays such as the former trade minister and even Mariam Mahathir are audacious enough to acknowledge that they are 3rd generation of immigrants even though they do not have the courage to admit which countries their fore fathers came from. Therefore it is save to say the so called Malays are also children of immigrants just like the Malaysian Chinese and the Malaysian Indians and that the Orang Asli and the Head Hunters are the original people of Malaysia and not the so called Malays. May be they should be called the robbers of the Malaysia and some of them as the descendants of the pirates. So stop calling the non Malays to return to their countries of their ancestors. Yeah right! What the orang asli needs is a church! These church people are guilt of ethnic cleansing, which is happening right before our eyes! They are wiping out a whole culture-society that existed for 60,000 years! In one fell swoop a culture, religion, traditions, tribal legends and myths, customs and language is going to be wiped out in one generation. Or they will all die of modern diseases passed by us. When was the last time you used a dictionary, Sir? I am a Christian. I am also a Chinese. Last time I check I haven’t been “ethnically cleansed” of my Chinese identity, yet. And no, I will not claimed that my Chinese culture/tradition is 60,000 year old. All I know about my own Chinese culture is that it is a shy of 5,000 years. But anyway, I am still a Chinese, still practicing my Chinese culture, speak my Chinese language, do my Chinese things, live my Chinese life, even though I am a Christian. Hmm… Or perhaps I am doing it all wrong? Should I be a non-Chinese from now on, that I am a Christian? I have given a briefing to representatives of foreign embassies, high commissions and the United Nations on The Dark Side of Democracy; Ethnic Cleansing (by Richard Mann, UCLA). I do not use dictionaries. When, oh when are our leaders, the Government going to realize that only religious tolerance will bring peace and harmony to the so called 1 Malaysia. These poor, simple Orang Asli have already distanced themselves and are happy. Just let them be…power exercised over the poor and lowly is a waste of time and shameful, to say the least. I’m once again humbled by your relentless pursuit for justice and equality for all. I suggest that the headmen also write to the PM and if he really means he’s open to the 1Malaysia he cooked up, he must show it by allowing the Orang Asli to freely embrace their chosen religion with a right to erect a place of worship. sad to see these churches being torn down. This is a form of religious persecution practised in Malaysia. Dept of Orang Asli should have no authority over the religious choice of the OA. 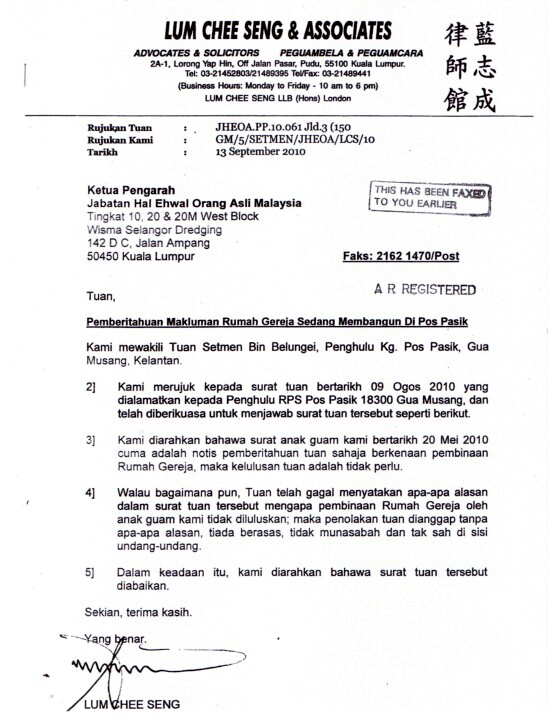 Remember the case of the Shah Alam church that was also ordered to be demolished after approval to build was given? That was under the last state admin. Thanks Haris for highlighting this OA church. ALLAH will surely bless your good deeds.